To check the balance on your Miss Selfridge Gift card, click here. Miss Selfridge was founded in London in the swinging sixties as a concession within the Selfridges department stores. Its first dresses were designed to be worn once and actually made of paper. With mannequins based on Twiggy, the brand developed more department store concessions before moving into stand-alone retail. Represented by the likes of Kate Moss, Tess Daly and Nicollette Sheridan over the years, the store works hard to stay ahead and on trend and is as relevant, fresh and contemporary today as when it was originally founded 52 years ago. So, where can I check the balance on my Miss Selfridge Gift Card? You can check your Miss Selfridge Gift Card balance by entering the details on this page of their website. Where can I buy a Miss Selfridge Gift Card from? 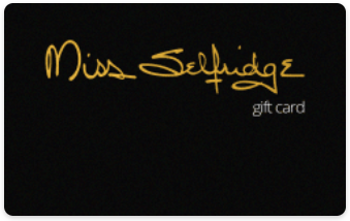 You can buy a gift card from any Miss Selfridge branch – click here to find your nearest Miss Selfridge store. If you buy from a Miss Selfridge Store, you can choose from a range of free gift card wallets to go with it. Miss Selfridge gift cards are available from larger branches of Tesco.